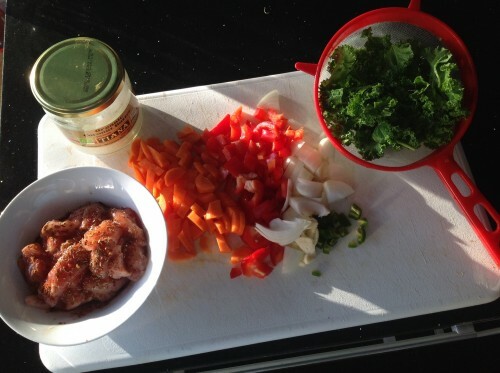 Todays healthy eating option is a spicy chicken and vegetable stir fry. Now I like spicy, but that can be an option for you. Cut your chicken into small strips or cubes. Season, salt pepper, dried chilli flakes and Chinese five spice. You could add some honey if you like. Mix in a bowl and leave until ready to cook. Wash your veg, rip the kale into small pieces and chop your vegetables into bite size pieces. Heat your coconut oil in the pan and when ready add the chicken. Stir fry the chicken until it starts to change colour. The chicken should be nearly browned to ensure cooked thoroughly. 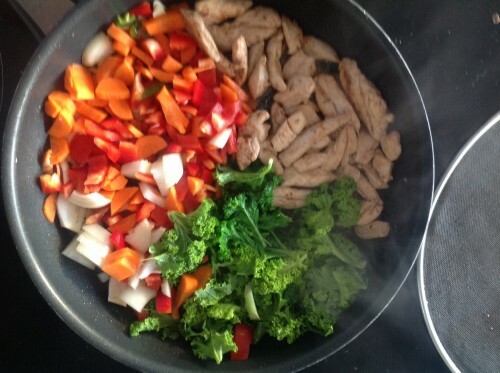 Add all your vegetables into the pan with the chicken and stir fry for about 5 minutes. If you don't like your veg with a crunch, then fry longer. Serve and add balsamic vinegar as a dressing. There should be plenty for two here, or eat a portion and keep a portion for later.